dreamed that Columbo was for real, and he'd come to town to investigate a series of bomb threats for which I was a suspect. I'd had a lot to do with the bomb threats (which somehow involved some incriminating floppy disks), and I was very nervous by the fact that the famous Columbo was working onthe case. t's different waking up at the childhood home. There's no ready-made coffee prepared by Deya, no Jerry Springer , no Jessika fixing herself breakfast in her black slip, and no mailman clunking our mailbox full of treasures reliably at 11:30am. It's still and undistracting here, more conducive to concentration, something I love. I miss the old situation a little, but I cherish the solitude still. I am not going nuts yet. Except last night, when I found myself plagued by tiny biting insects that find their way through the screen and attack me as I type. Those critters simply don't exist in Charlottesville, where you canget along just fine all summer long without a screen at all. decided to put a new tire on one of my old Dart wheels, since it seems impossible to find the right kind of wheel at Tate's junkyard in Charlottesville. I arranged to have my mother Hoagie drive me to Staunton to getthe tire. While we waited for the guys at Hershey Tire to do their thing, we crossed Market Street to Robby's, an import repair place where Hoagie takes her Subaru. She swears by the place. My parents have always been of the opinion that in the long run it pays to develop a good relationship with your mechanic and never argue about what he charges. A good mechanic knows he is best off not ripping off his most reliable customers, and a customer knows when he has found a good mechanic, it's a little like finding a goodwife. Hoagie is in the market for a used truck with which she hopes to be able to pull horse trailers. Since Robby has connections in the Staunton used-auto scene, she's been asking him about possible deals. Meanwhile I'm in the market for a reliable used car. Robby had more car possiblities than truck possibilities, and told me about a Honda Accord that one of his customers owed him, saying I should call him back tomorrow. Robby doesn't look too good these days. His wife is divorcing him, so Robby has been depressed of late. He's also gained a lot of weight. Next we stopped at Co-Art, the co-operative gallery in downtown Staunton that Hoagie helped found. She's the featured artist for May. I've seen all her stuff before, but I thought I'd humour her and look at it in the gallery too. She actually had a couple things I hadn't seen before: a cat that looked like it needed to run off soon to its litter box and a little pastel-on-black floral still life that I rather liked. I took a few pictures with my digital camera after first running to get some batteries for the hungry little thing. 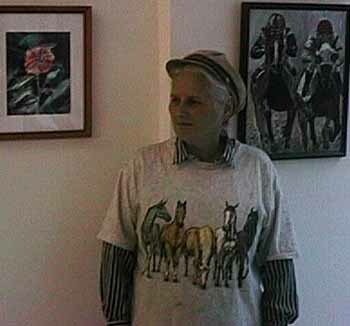 Here's my mother posing next to paintings featuring her favourite themes. The other Co-Art people are never especially friendly; I wonder if they all secretly hate each other for their pretensions or artistry. The tire ended up costing$50. Ouch. But in the snaily maily I got a check today from someone who claims to appreciate my musings so much that he's willing to pay me money, kind of as if I'm a one-man public radio station, except I never have fund drives and this particular contribution came completely unsolicited. But, hell, I'm cashing thatcheck and I'll see to it that he gets his money's worth. I had a conversation with my Dad about possibly publishing a web-based ecological ezine. He's been surfing the web and finds the ecological content meagre at best. I figure an ecological ezine, one that eventually builds up a respectable readership, could be effective at fund-raising, as well as publishing my Dad's original research, which of late has focused on the relationship between ecological communities and the underlying geochemistry. Meanwhile my brother Don has been studying up on his famous marathon-running grandfather and has come to fear (in his particularly psychotic way) that he, Don, might actually be kidnapped in aLindbergh's baby kind ofway. or some reason, isolated as I am from social madness, I don't feel any strong urge to go on systematically about what happened to me today. It rained, I puttered around in my shaque. What more is there to say? I'm keeping both busy and happy.